To buy tickets for this event please visit the events page: The Acoustic Festival of Britain event tickets. A firm favourite to start the season. 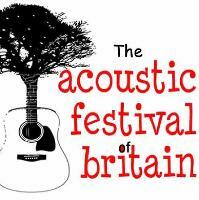 The Acoustic Festival of Britain brings you a great variety of Acoustic music, bringing you some of the classic artists to those who are newly emerging on the circuit. With 3 stages running, we bring you not only music, comedy, opportunities at our workshops to learn how to -play an instrument /make something /acquire new skills and knowledge. A lot of new additions and attractions will be appearing at the 2019 show, keep an eye on our website www.acousticfestival.co.uk for news and announcements. Camping is conveniently situated close to the arena and you can park your car next to your tent, Live in vehicles are welcome, and if camping isn't for you then consider the Glamping available. We like our comforts so we have FREE Hot showers for your use, proper flushing loo's, even use the Grooming salon where you can dry your hair etc.